Bracelets have been an important piece of jewelry for a long time now. 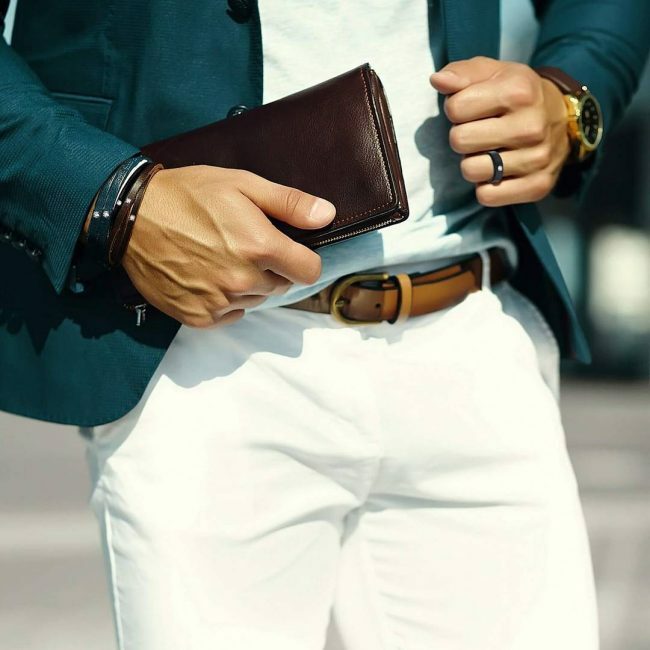 Initially only done by women, bracelets have evolved in both style and sexuality to accommodate male counterparts as well. 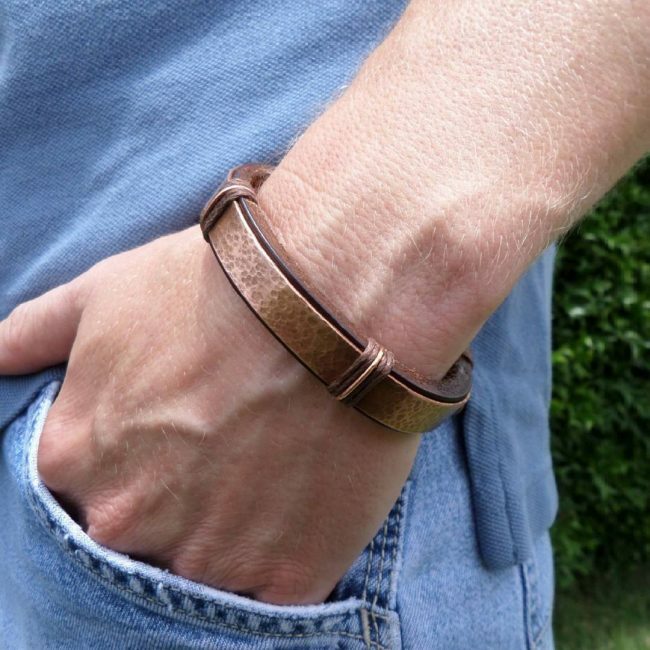 Here are 25 men’s leather bracelet ideas. 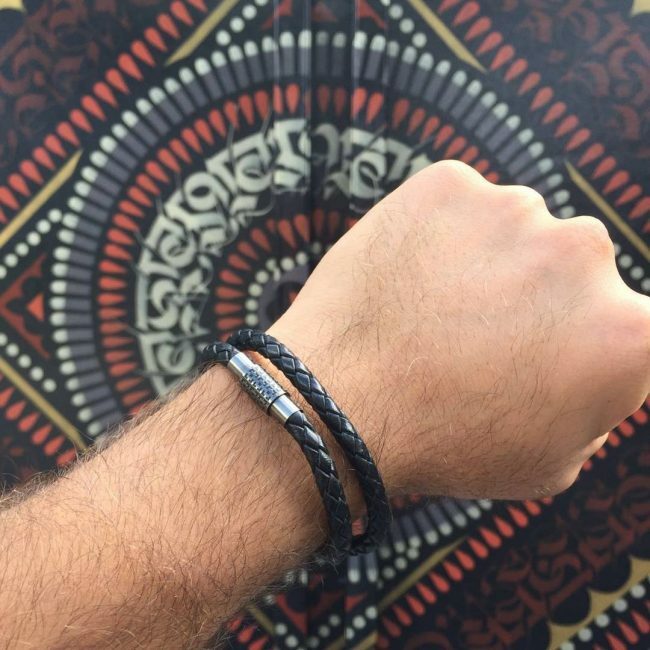 Simple yet stylish in every sense of the word, the black leather braided bracelet is ideal for the simple guy. The bracelet has a magnetic clasp thereby ensuring it doesn’t fall off easy. 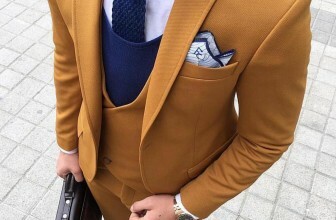 It’s simple and not thick to suit any form of fashion. The anchor bracelet is one that will have you getting some attention. Made by two leather straps of black and brown intertwined, the only better feature is the ship anchor that holds the bracelet to your arm. 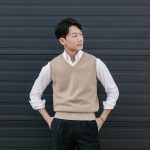 It is comfortable to wear and can be shipped all over Indonesia. 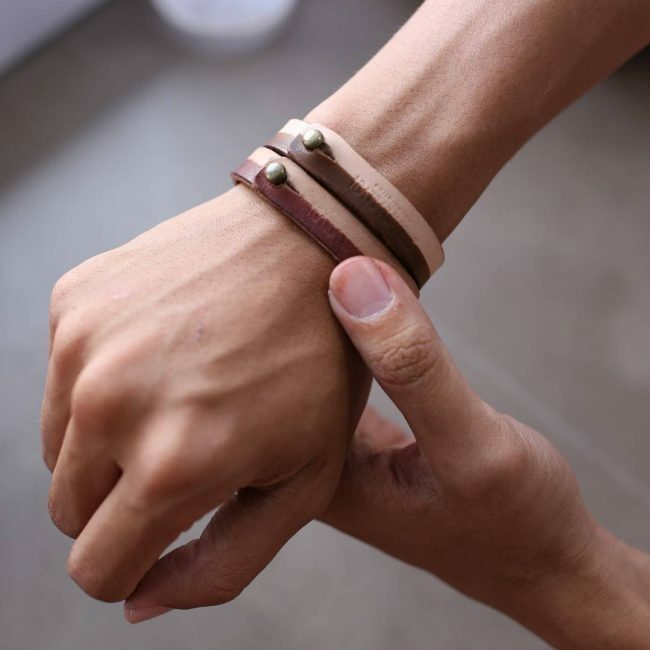 This men’s leather bracelet is as simple as they come. 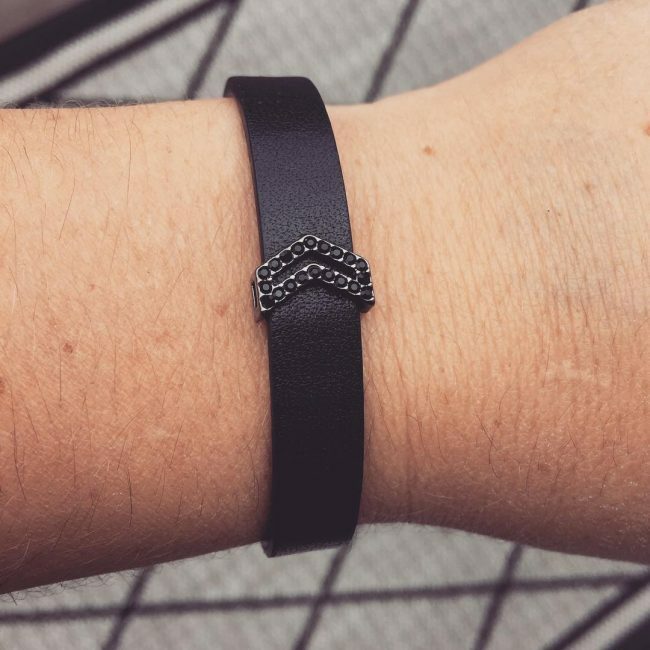 The hematite pave chevron cutout looks like an arrow and the essence of it is to remind you of how far you have come or key points in your life and the direction they took. The bracelet is available in rose gold, silver or gold. 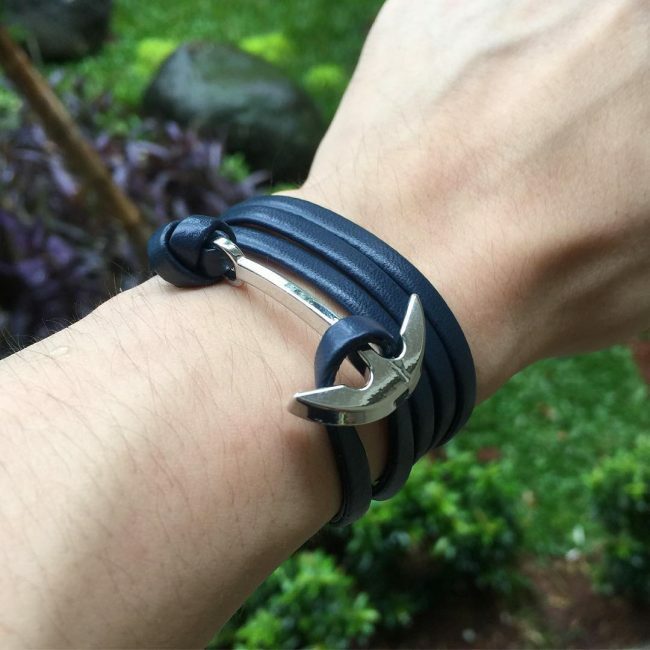 Unlike the other anchor bracelet mentioned earlier, this leather bracelet is sorely black in color. However, the silver hook gives it a nice appeal and a decent look for any man to wear. The standout feature for this men’s bracelet is the two gold arrows at its clasps. Brown in color, the bracelets additional features are a green string that helps you tie it to your arm, some silver rings, and arrows. 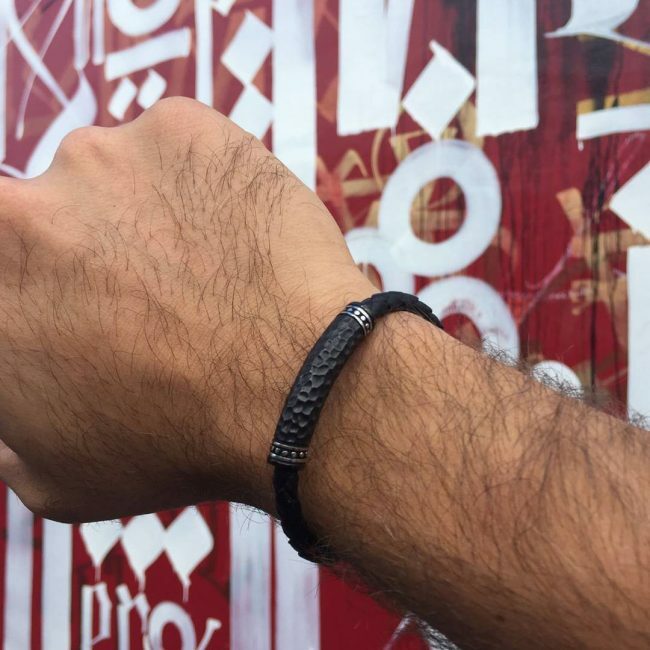 This bracelet is for the adventurous man. One of the best highlights of a man’s jewelry is when a woman looks at it and goes aww. 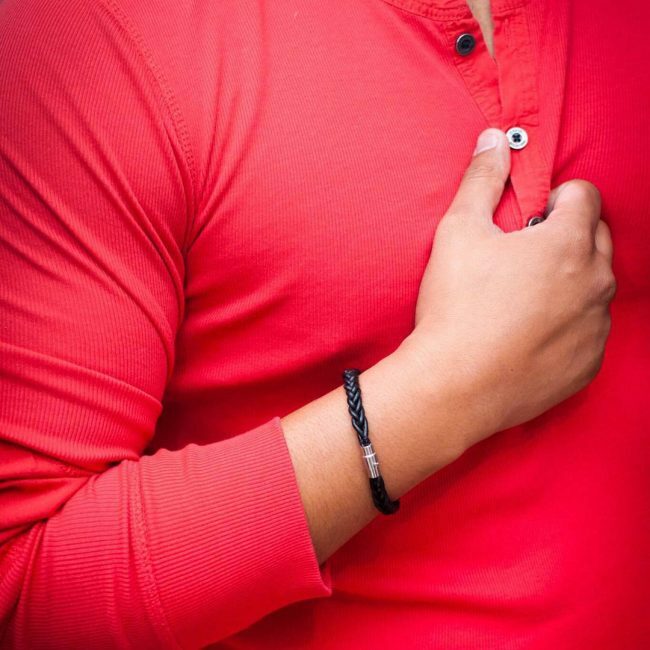 This maroon men’s leather bracelet elicits that feeling from anyone who sees it on your hand. It also has a silver template that can allow you to engrave any message on it. 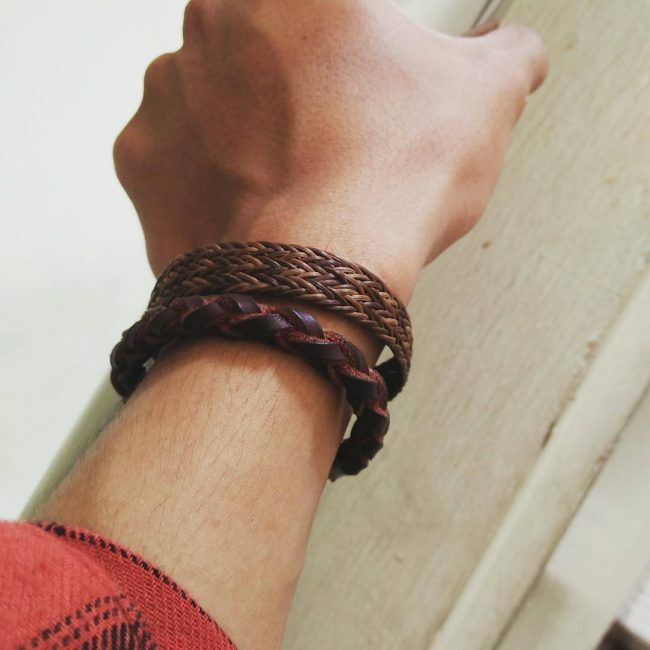 This is yet another simple yet very good looking leather bracelet for men. Carefully handmade, the bracelet is mainly two intertwined leather straps that hang out at the end to ensure flexibility and easy removal. However, it’s only available in brown, though. 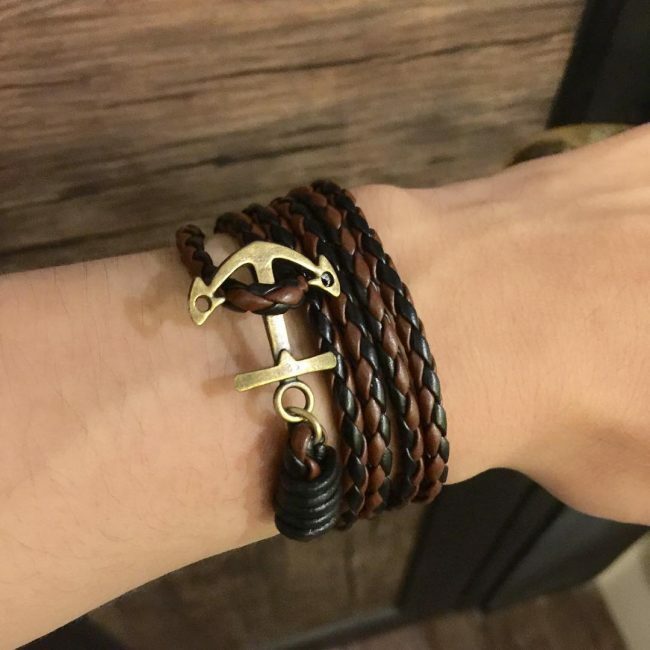 Just like the other anchor leather bracelets, this one has an anchor too. However, it is the colors to the leather straps that make the bracelet that change. The anchor is also arguably smaller but that gives it a cool simple appeal. 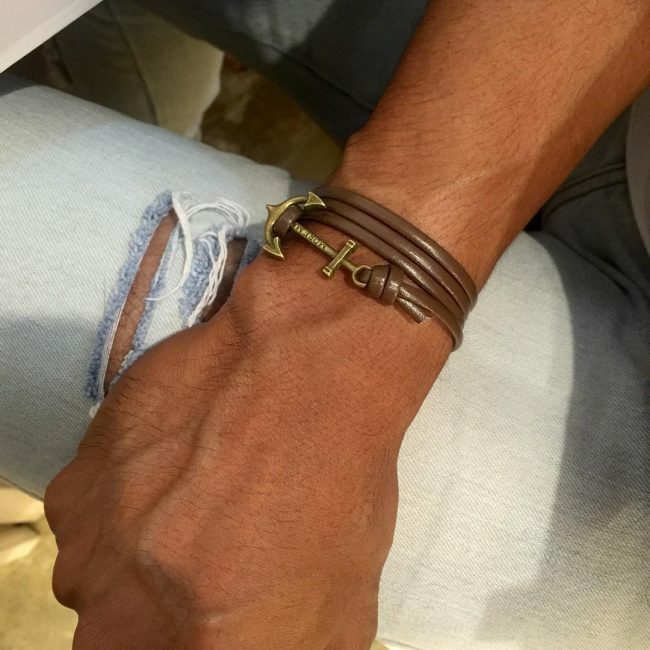 Men’s leather bracelets are mostly not about fashion sense but a manly feel too. 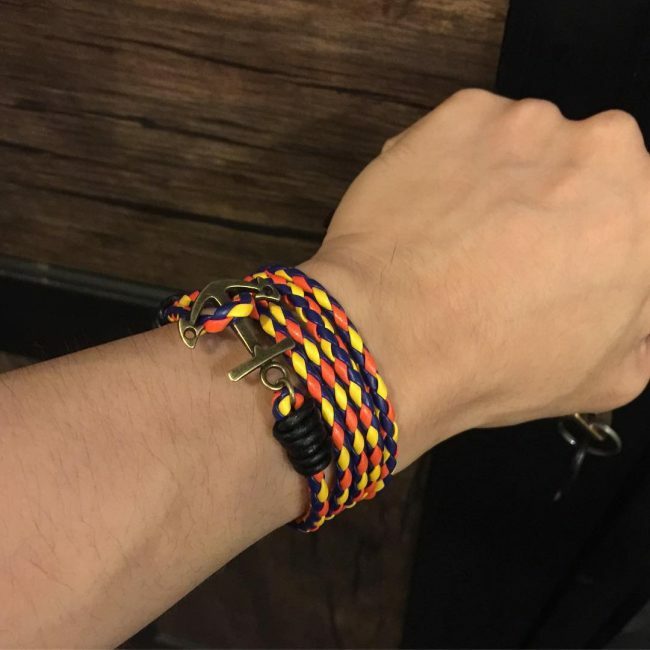 This bracelet exudes a manly aura when on your arm. It also fits perfectly and comes in various sizes. 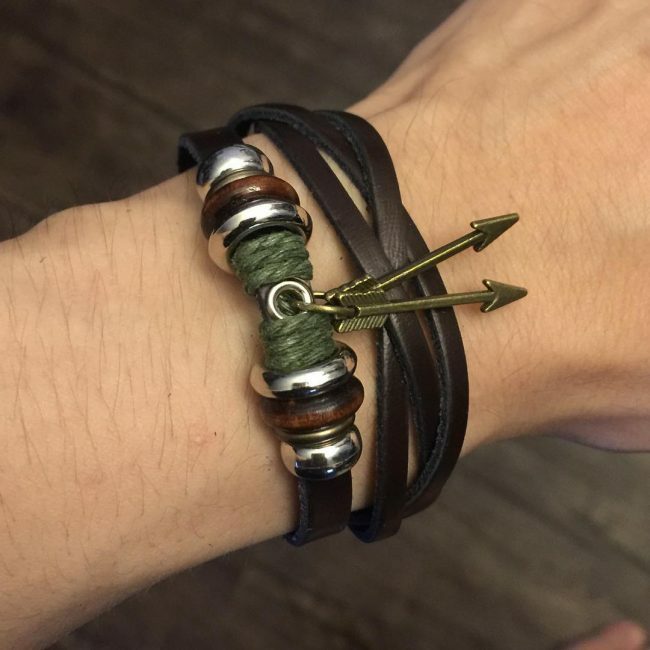 These leather anchor bracelets are quite the thing aren’t they? 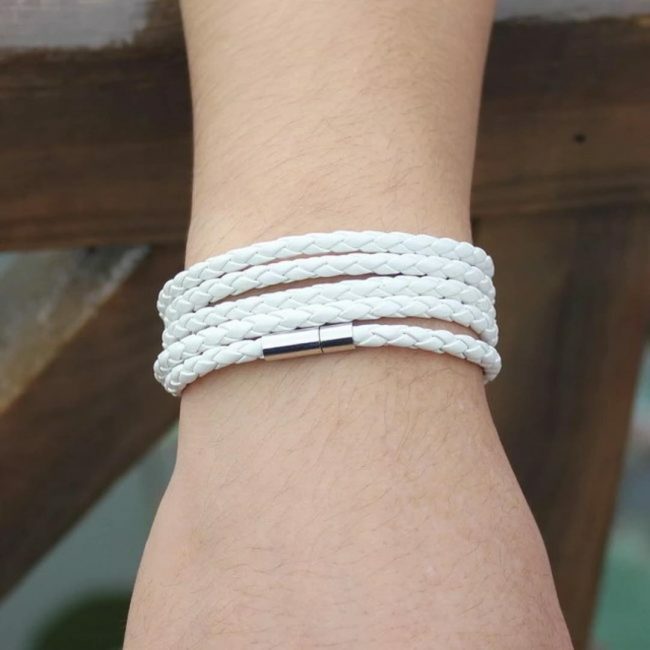 This leather bracelet is similar to the other anchor bracelet with the exception of the colors which give it an amazing look. Most men’s leather bracelets are handmade. This bracelet clearly shows that with its intertwined brown leather straps that are clearly good workmanship. Simple and easy to wear. This bracelet is similar to the first bracelet we talked about. The only difference is the fact that this one is white. It also has a magnetic clasp to give it that firm grip on your hand. If you are a blue collar worker, I’m sorry man but this is not the bracelet for you. 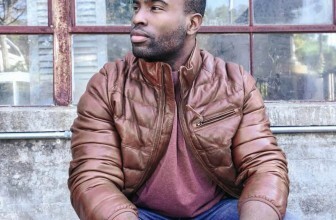 The leather wrap bracelet is ideal for the short sleeve shirt man as it coils around your wrist four times. However, it is still a little loose for comfort. 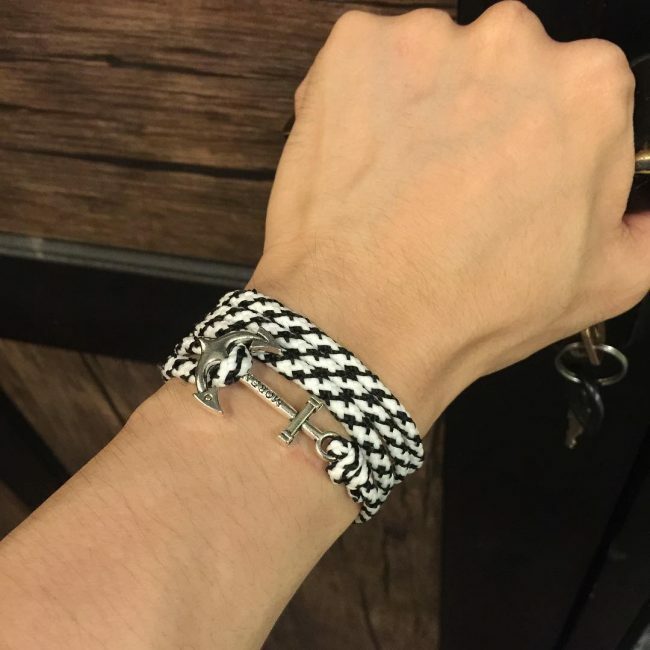 More anchor men’s leather anchor bracelets. However, this one is not braided, just a comfortable leather strap that wraps around your wrist and is fastened by an anchor. Simple and elegant too. 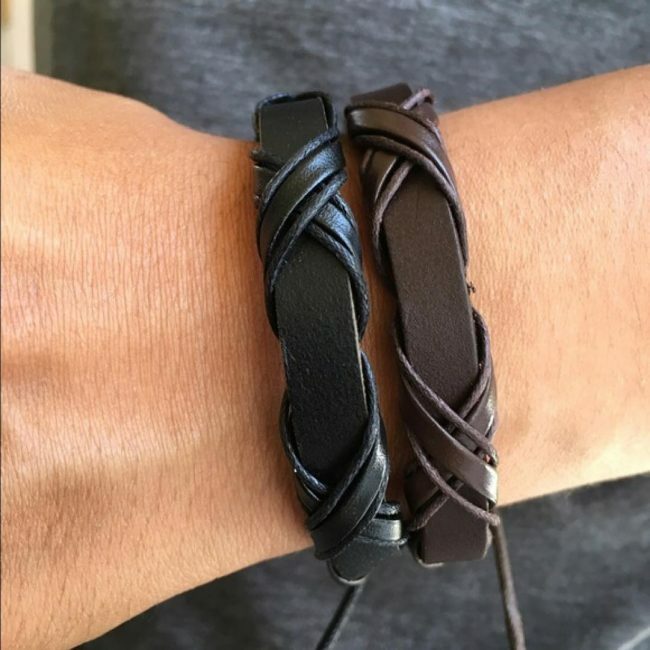 This men’s leather bracelet looks like two bracelets in one. 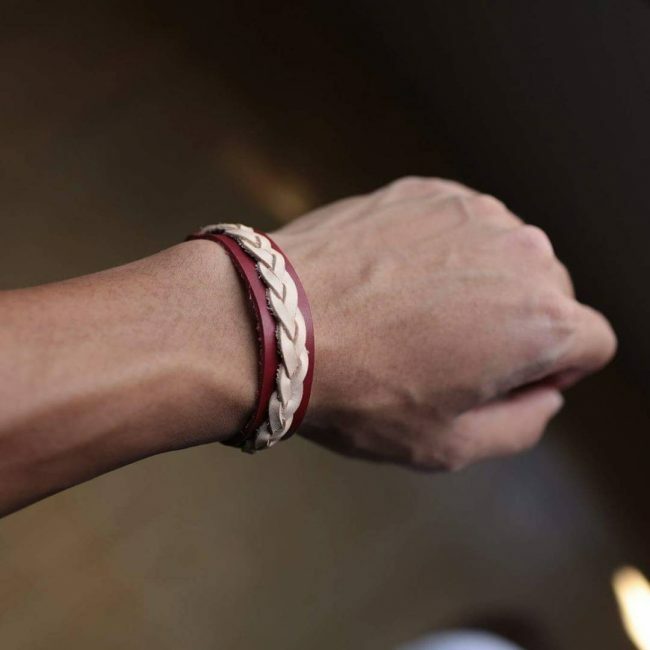 Two cream leather strands and braided atop a maroon leather strap to make it look like two bracelets in one. Pretty smart and yet simple too. This men’s leather bracelet has it all. 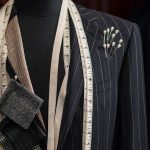 From a fashion sense to a wide range of colors and availability in all sizes. 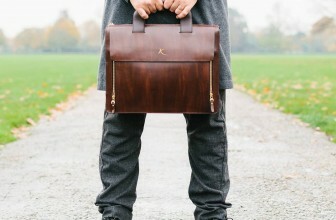 However, the mahogany and dark brown version stand out among the rest. 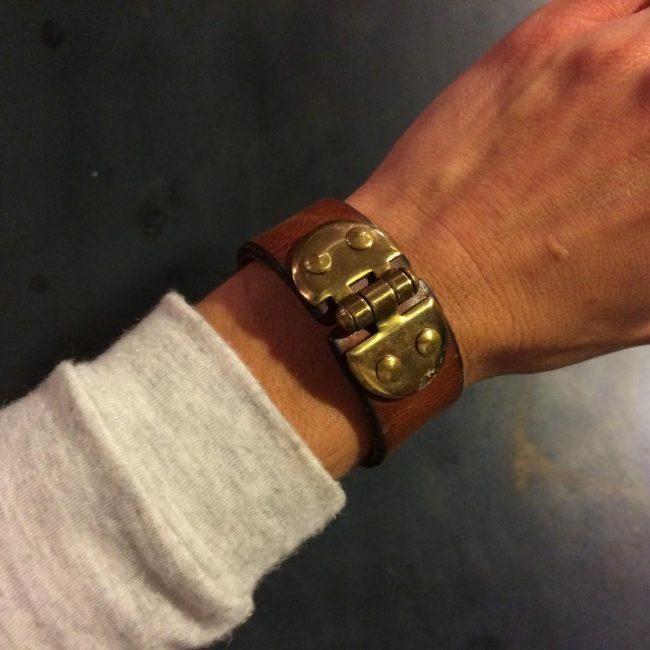 Imagine a belt as a bracelet. You may think, too long, well the bracelet is designed for your hand, not your waist. This bracelet is an amazing early 90s-esque belt that was cut down and repurposed as a bracelet. Pretty dandy workmanship too. Men’s leather bracelets try to incorporate anything manly, so to say as seen in this bracelet. Apart from the braiding, the other standout feature is the signature gunmetal clasp. Looks simple yet stylish. 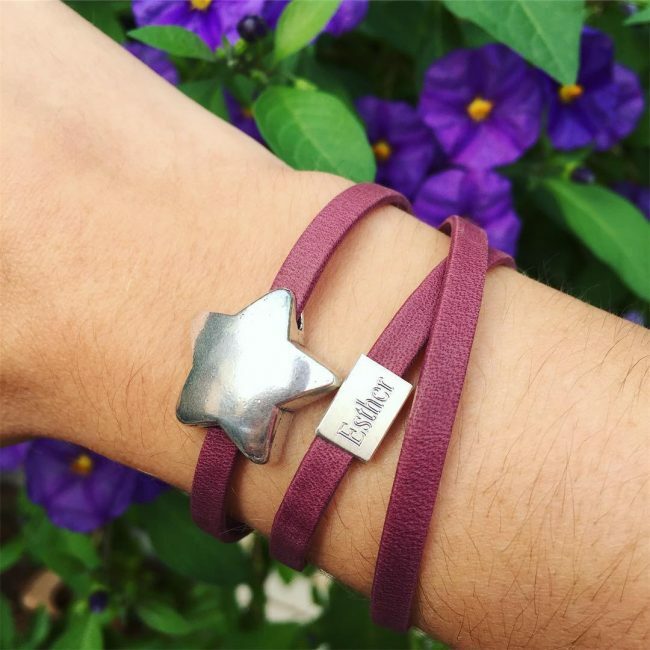 This bracelet is as simple as they come. Three braided leather straps pass through three rings to give the bracelet that cool look. 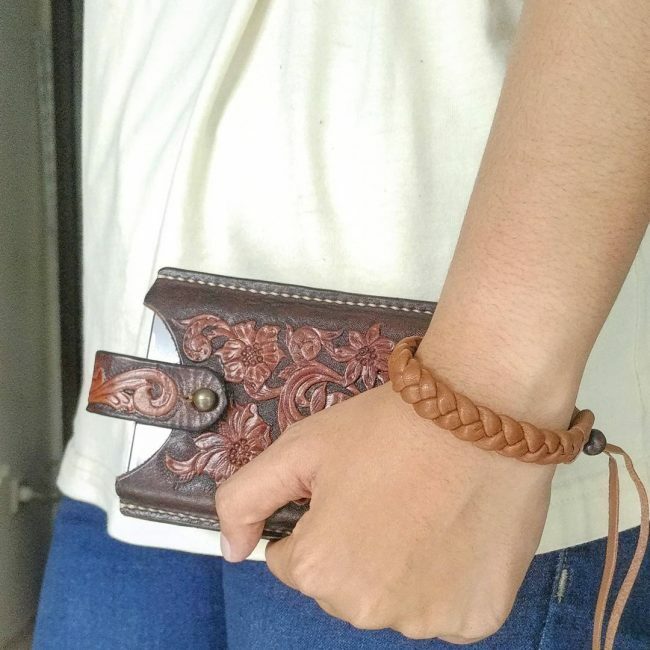 This men’s leather bracelet is no different from the one above. Every detail is the same, the only difference is the color. This bracelet screams corporate in every way. The simple leather straps that wrap around your wrist are adorned with a diamond each. Best advice, make sure it fits. Simple yet very classy, this bracelet is arguably the best I’ve seen, by my standards at least. 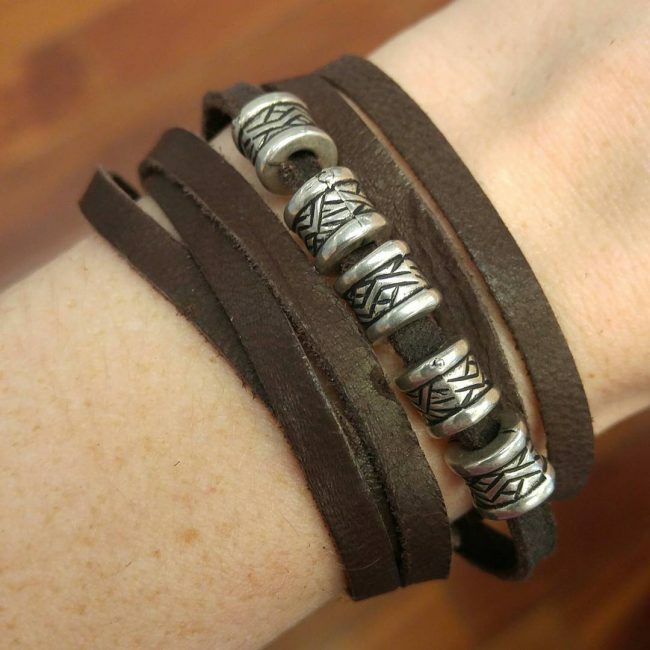 A hollow stylish steel pipe covers a small part of the braided black leather bracelet to give it that stylish appeal. I would wear this one everywhere. Yes, they do have those types of bracelets too. You can wear this bracelet as a headband or as a necklace. This makes it easy for say when you are on the beach and want to play volleyball but you are wearing it a chain so it keeps hitting your face. Just wrap it around your wrist. 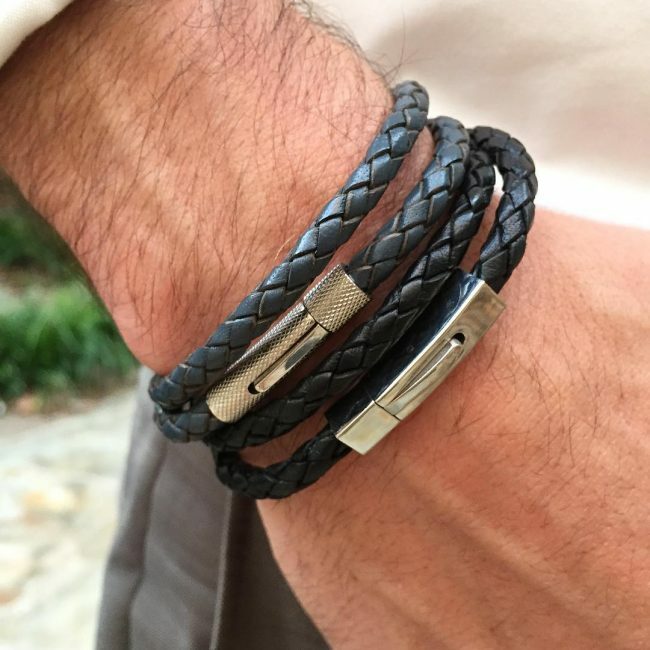 As we have seen, men’s leather bracelets come in all forms and sizes. 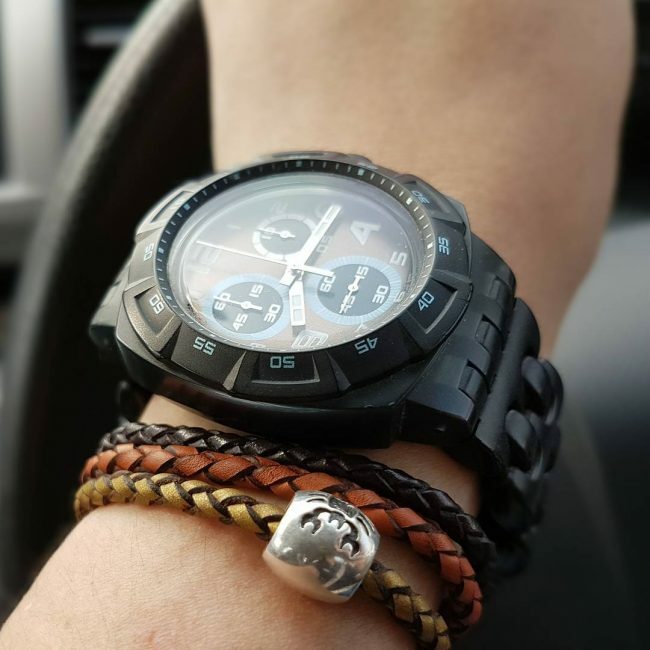 This bracelet has both black and brown straps and additional ones on top that give it style and a calm sense. Ideal for the simple guy. This bracelet is both beautiful and stylish. It is three braided leather straps in black, maroon and gold with a ring through the yellow strap. The standout feature may be the ring but even without it, this bracelet would still look amazing.